Hopes that the focus would solely remain on football were not fulfilled in Gibraltar. John Delaney watches on at the Victoria Stadium in Gibraltar. RUMOURS FLY FASTER than the wind at the foot of Gibraltar’s Rock. 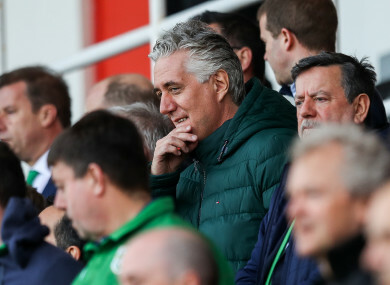 After a week dominated by the revelation that John Delaney granted the FAI a €100,000 bridging loan to aid a cash-flow problem in April 2017 — the loan was repaid two months later — the hope was that Ireland could finally just focus on the football. The minutes before kick-off were dominated by speculation about John Delaney’s position, given word had filtered through that the FAI would be releasing a statement after full-time, and that it wouldn’t be a match report. As Delaney’s seat beside the press box sat empty, bearing only a rudimentary A4 sign reading ‘FAI’, Irish fans in the stand opposite him unfurled a critical banner. As they did so, Delaney was spied loitering behind the scenes as many of the rest of the various dignitaries took their seats. A few journalists snapped Delaney through a window below a sign reading ‘VIP Exit’. He then emerged during the Irish national anthem, taking his seat during the song’s final bars. The game got underway, and the banner made another appearance minutes into the first half. As Ireland toiled on the pitch during the first-half, rumours about Delaney’s exit clogged Twitter timelines. The banner then made a more conspicuous appearance as the game ticked into its final stages. Its owners moved it to the side of the pitch, in full view of the television cameras. Stewards ordered fans they retreat with it, although the banner wasn’t confiscated. This led to sustained chants against Delaney from the travelling Irish fans. After the players and management breathed a sigh of relief comparable with the wind upon full-time, journalists with reports filed skipped down the stand to the press conference, expecting that the football match was about to be relegated in importance. Mick McCarthy emerged for his media duties, and was asked if the “circus” behind the scenes had proved a distraction. “Not at all,” came the response. By that stage McCarthy’s press conference had already been interrupted: a journalist frantically typing at the back of the room, facing the wall, took a call to confirm something or other with his boss. “No,” came the plaintive reply. Mick left and Julio Ribas arrived. A few minutes later, an FAI statement followed with him. If you’re surprised that you haven’t read the Gibraltar manager’s opinion on Ireland, it’s because for once, he wasn’t asked about it. The assembled Irish media were too busy staring at their laptop screens. John Delaney isn’t going anywhere. Email “Speculation on Delaney's FAI future flies faster than the Gibraltar wind”. Feedback on “Speculation on Delaney's FAI future flies faster than the Gibraltar wind”.